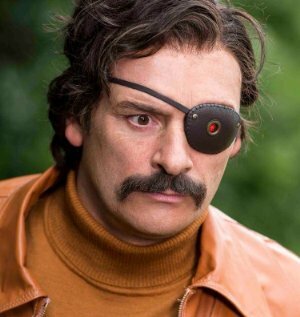 Bruce P. Mindhorn (Julian Barratt) is a former secret who has a cybernetic eye he can use to see the truth. Now, he’s the best detective the Isle of Man has ever seen. WAIT, NO. (Record Scratch Sound) Richard Thorncroft (still Julian Barratt) is an abrasive, washed-up British actor who played Bruce P. Mindhorn in a two-season ‘80s sitcom. At the end of his rope, Thorncroft lucks into a bizarre, long-shot potential PR coup when crazed serial killer “The Kestrel” (Russell Tovey) demands to negotiate with Mindhorn, whom he believes to be a real cop. This is, I think, essentially a more awkward version of Alan Partridge: Alpha Papa. I'll basically watch anything Julian Barratt is in. I couldn't tell if Mindhorn was any good, but I could tell that I liked it. Really looking forward to this. Saw the music video for You Can't Handcuff The Wind this morning, what a tune. Also, I think it’s worth noting that The Sniffer is a Ukranian show that can be streamed on Netflix that essentially is Mindhorn, except with a nose instead of an eye. OMG The Sniffer. I had to watch an episode of it just to actually....see it. I still can't come up with the words for that experience. Another thing that I'd compare this to is Galaxy Quest, only this has more teeth. Galaxy Quest was made by Trekkies. Mindhorn was made by people who hate '70s cop shows. Do you really think that they hate them, though? Because I felt like there was a lot of affection for them, and specifically for the Six Million Dollar Man/Knight Rider/Greatest American Hero science fiction/cop/secret agent crossover subgenre, what with the cheap merch and the obsessive fan and whatnot. This may come as a shock to you, but I don't think that Richard Thorncroft is actually very good at capoeira. ... but he moves between the air! He's the bringer of the Ginga! He (finally) did his own stunts! He dodged bullets!